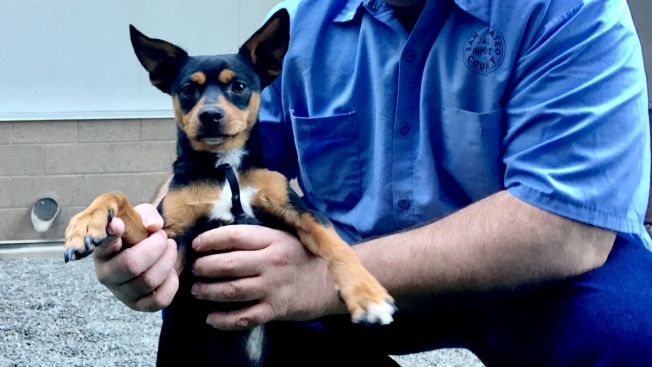 The Peninsula Humane Society & SPCA (PHS/SPCA) and San Mateo County Sheriff’s Office have been in close cooperation to pair dogs that need extra attention with inmates who act as full-time handlers for the dogs. 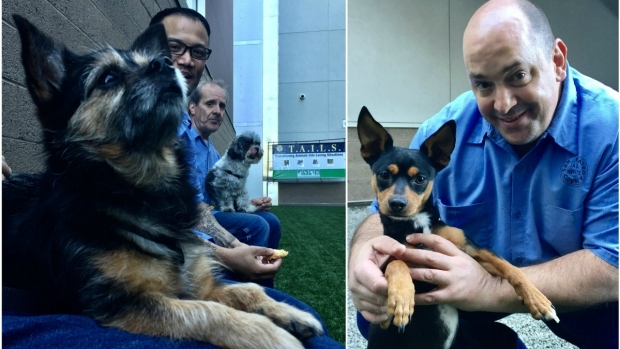 Four of the first dogs to enter the program at Maple Street Correction Center graduated from the program Friday, saying ‘goodbye’ to their temporary digs and ‘hello’ to their permanent homes. An inmate at the Maple Street Correction Center sits with a dog at the Transition Animals Into Loving Situations' (T.A.I.LS.) graduation ceremony. From movie nights to doggy play dates and training sessions, the dogs received more one-on-one attention than they could get in the shelter, according to PHS/SPCA Communications Manager Michele Moyer. The dogs that participate in the Transitioning Animals Into Loving Situations (TAILS) program each spend eight weeks full-time with two inmates and recieve training throughout their stay. 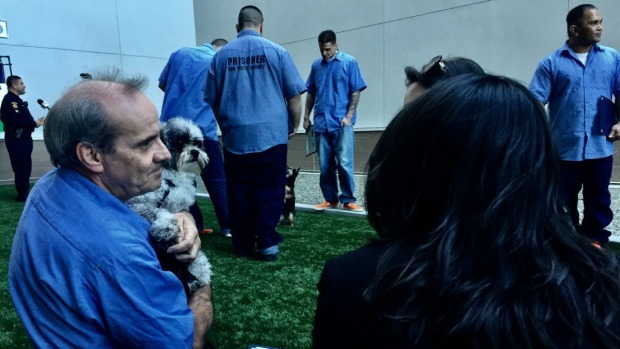 Inmates pose with their dog at the Maple Street Correctional Center. The two helped train Tasha for the last two months through the 'Transition Animals Into Loving Situations' (T.A.I.LS.) program. Salvador Zuno, a Public Information Officer with San Mateo County's Sheriff's Office, said that the program is just one of several efforts created to help decrease criminal recidivism. Zuno said around 80 inmates have participated in the program so far. The program just transitioned to its new facilities in Redwood City, where they have built an outdoor space to accommodate the program. Behavior and Training Director Maria Eguren said the next class of dogs will be paired with women inmates at the facilities. Elfie is held by Warren Tuckerman, an inmate at the Maple Street Correctional Center, who helped train her for the last two months through the 'Transition Animals Into Loving Situations' (T.A.I.LS.) program. She is currently adoptable through the Peninsula Humane Society & SPCA. 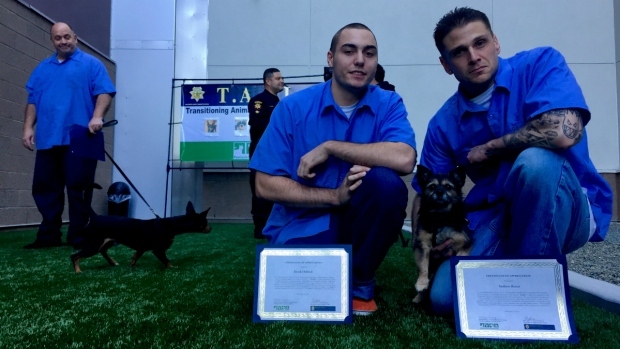 After the graduation ceremony Friday, three of the four dogs will be leaving to their forever homes, including the home of the San Mateo County Sheriff's lieutenant, who personally adopted one of the dogs at the ceremony. Interested adopters for the remaining dog or future dogs in the program can contact Maria Eguren at meguren@phs-spca.org.